This fashion magazine page from the early 1930's plays up some great ways to use buttons. The slinky, slender silhouette of that era looks great with the sleeve variations shown here, some sporting button accents. Neckline and shoulder yokes, sleeve cuffs, pockets and shoulder straps have buttons as well. Part of what makes the look so elegant is the accessories. Their gauntlet gloves really have great style. And it would be hard to miss those jaunty little hats worn at an angle over the forehead with a bit of finger waved hairstyle peeking below. 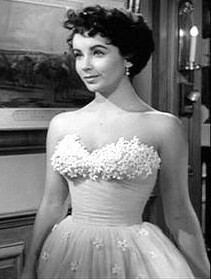 The white gown that Liz Taylor wore in 1951 for "A Place in the Sun" captured the imagination of college and high school girls everywhere. The style and silhouette would become one of the most popular prom and wedding gown looks for the decade. This original costume illustration by Edith Head must be an early version, since the "V" waistline shown was later changed to become more conventional. 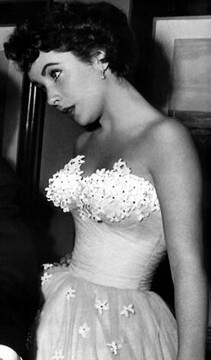 When looking at the photos it is easy to see that the blossom details are carefully placed, not to overwhelm the bodice. 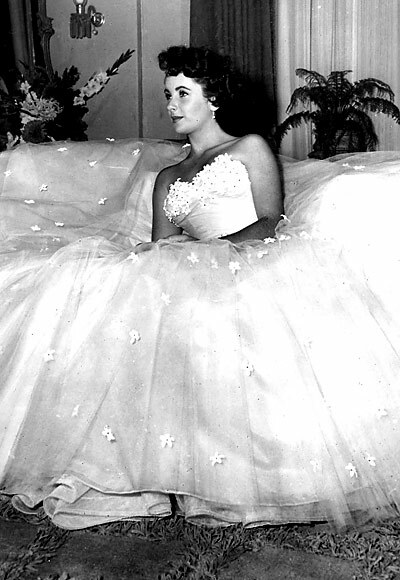 Similar white velour (or velvet) violet blossoms are scattered all over the bouffant tulle skirt. These two Butterick patterns: Long version #4928 and short version #5457 are excellent sewing patterns to use if you want to try making your own version in tulle layered over taffeta. It's really a very simple dress design, the blossoms scattered all over are what makes the difference! This unusual gown by Schiaparelli was designed in 1947 and shows how she draped to create drama and new silhouettes. The hem of this silk gown is shorter in front where the bodice is shirred across the waistline. In the back the hem lengthens, complimenting the puffed bustle-like bow which accents the "V" neckline. Summer of 1979 had alot going for it, as this vintage fashion photo shows. This style is back on top of current spring and summer trends by being both cute and wearable. Even the longer length looks fun for summer this year. The color chips I show here are for Spring/Summer 2013 from Design Options predictive services. Looking at them, it's not hard to see how the late 70's has sparked a revival in vibrant prints and bright solids. Not neon or pastel, but true 'balloon' colors. Keep these hues in mind when you look though vintage from the late 70's and into the 80's. There's alot of undiscovered beauties waiting to be found! In August, 1969, Cybill Shepherd at Hunter College, was one of several college women featured in the college issue of "Glamour" fashion magazine. Although she was on the cover, it is the editorial shots that really capture her iconic 1969 great look. These photos present the ideal look of the day, as she would wear it at that time. After this feature, she would be seen in many more magazines to come. From a fashion perspective, everything that she is seen in here is wearable today without looking too retro or costumey. It's pretty amazing to think without making any changes, styles over 40 years old can be worn today as a current trend. "Young Innocent" was a junior petite label designed by young Sue Wong when she was fresh from her training at L.A. Trade Tech college. This label was under the "Arpeja" brand. Wong's designs were young, spirited and very trend conscious. 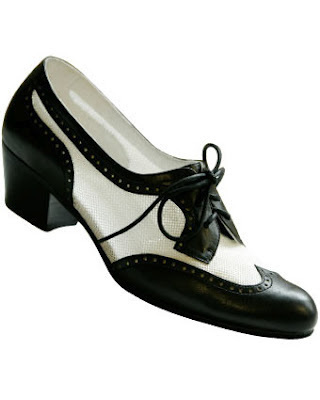 These and her "Young Edwardian" designs would become iconic junior looks for that era, one of several strong junior brands being developed in Los Angeles at that time. These illustrations show the strong design influence of Peter Max during during the late 1960's. Sort of 'trippy' in style, with elements of the 1920's illustrator John Held, the figures create a great look that identified that brand from others at the time. 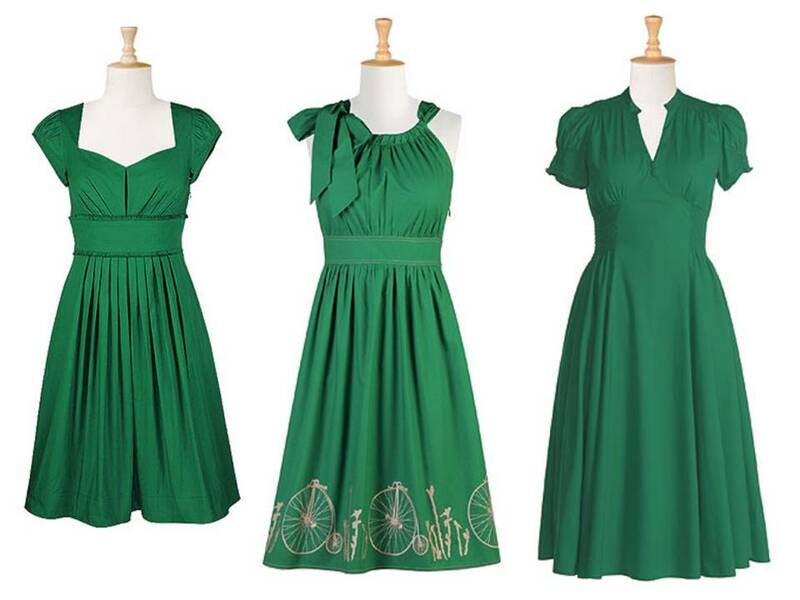 I recently came across eShakti online. For those who haven't seen this site yet, it's a fashion business, with styles that may tend toward Anthropologie or ModCloth. As a shopper, the site allows for color specific shopping, along with price range. This is a nice way to view their dresses, especially if you have a certain color you'd like to find. They do have blouses, skirts and accessories, but dresses seem to be the main item here. 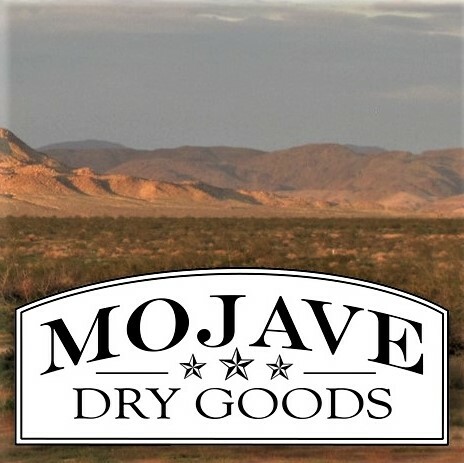 What gives this e-store a different perspective, is the size range. With a bustline list from 32" (size 0 or XS) to 53" (size 26W or 3X) they can fit just about anyone. 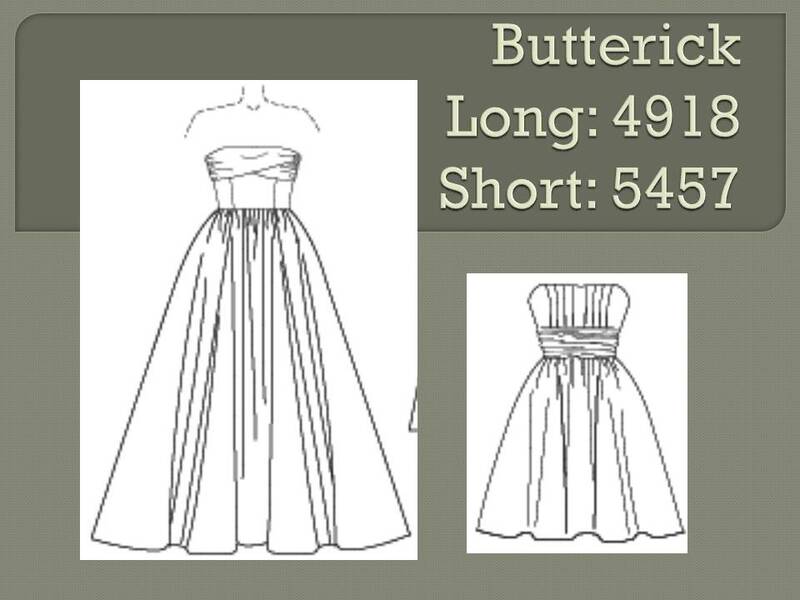 Now this is interesting to me, especially when the difficulty of grading a dress pattern this widely is considered. And not only that, they allow for customize styles. There are alternate versions of the sleeve available, and the hemline length can be chosen. What the US consumer may not realize when they order their custom dress is that it won't be made in the states. Instead this venture is based in India and started selling to the US in 2008. At this time, their website does not list country of origin within their pages. Not in the 'about' pages or with each garment description. Even the fiber content description is loose, without percentages of fibers or a complete list of fiber content. Rather they give a general description of the textile composition. EShakti prices are between budget and moderate, low prices being one of the main advantages of producing their product in India. Clearly, there are objections of such a low price point product in competition with domestic fashions. Some customized apparel businesses exist online, but not at this level of style selection. To try and reproduce the diversity, inventory and turn-around locally at that price point might be impossible. It would be interesting to see how a domestic company based on the same concept would do. If 'made in the US' becomes more popular, maybe we will see something like that in the future. This jacket and skirt was designed in 1942 by Louella Ballerino. She mixed applied rows of ribbon, metallic braid and colored fabric bands on black rayon faille background on a dirndl skirt. The prim fitted jacket with notched front peplum was worn over the gypsy style skirt. She was a strong influence in the adaption of ethnic garments and textiles into popular fashion, and this outfit is a good example of that look. Recently there have been several strong trends in color blocking that seem to be inspired by her designs. In looking at this, it is easy to imagine wearing a similar skirt today. A press release for Holiday, Winter of 1944 gives us the more information about her collections at this time. During the 1940's she was influenced by Mexican design and themes. Ms. Ballerino gathered her inspiration from trips she made to Mexico, collecting textiles, garments and samples of embroidery that she would later use in her designs. At the time she was known for using ribbon motifs in her fashions. Bright and casual, these were often sporty, leisure wear ensembles that could make the transition between day and night. 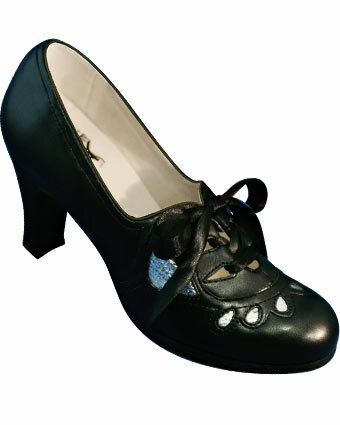 They were worn for evenings at home, dinner parties, and dancing. To create these designs she used bengaline, usually in black. This was a shiny, ribbed textile of rayon with a moderate weight and crisp hand. Her ribbons were as narrow as 1/4", and ranged up to 6" wide. The ribbon colors were bright; fuchsia, blue-green, lime and other tropical colors. The colors were given more emphasis by the black bengaline background. Bodice silhouettes were designed in off-the shoulder blouses of the same bengaline or a long slender tops with a basque or peplum bottom worn over that gathers of a dirndl skirt. It could have long loose sleeves. Some tops had horizontal ribbon work as well. Gathered dirndl skirts were a signature for her. Normally during this era, women wore "A" line or nearly bias skirts with less fullness. She also included black pants with the ribbon group. Other lines she designed during this time would have matching bra tops worn with culotte shorts and jackets to go over the bra, along with peasant type blouses. These all contributed to the casual outdoor lifestyle that California was marketing at the time. They were looks that were seen across the country, sold in better department stores. It was a great time for American fashion design. This dress is currently on display at the Los Angeles County Museum of Art. Information on the exhibit is HERE. 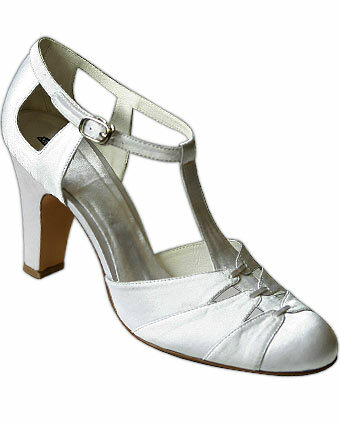 If you are looking for the perfect 1940's and 50's summer wedgie sandal, then look no further. 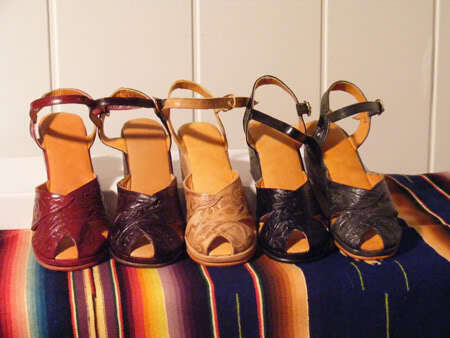 Hand made in Mexico, these tooled leather wedgies are super cute and comfortable enough to wear all summer. 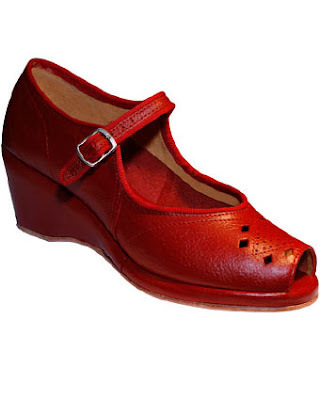 They are available in several colors, from red through natural, black and brown. 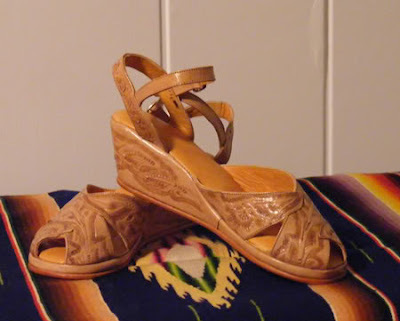 If you are on the west coast, you may have an easier time finding a pair, but online there are several websites that carry this fabulous sandal. If you are in Los Angeles, visit Olvera Street to find them HERE among the stalls down the center of the street. I found mine in a stall with many other styles of sandals. 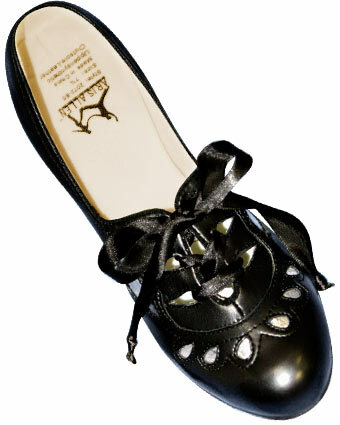 All of the great shoes here are by Aris Allen and are currently available for sale online. This means that it's possible to find a style and fit for your modern foot, without having to resort to fragile vintage models. 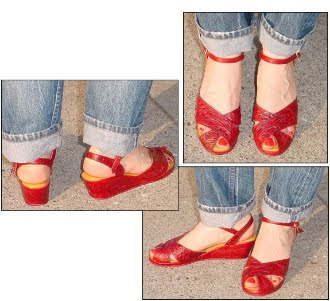 What's even better, is that these are dance shoes. We think this means that they will be comfortable as well. But beyond comfort and availability, the styles are so fun! 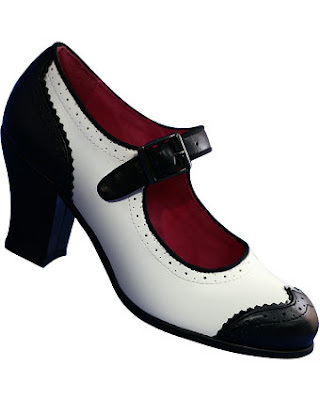 At a time when retro shoe copies are walking down the runway with high price designer logos, it's good to know where to find a retro style shoe for the outfit you planning to wear. Post WWII, Late 1940's, "Lilli Ann" label vintage fashion advertisement, showing the peplum jacket and dramatic silhouette that the San Francisco company was famous for. A Lilli Ann suit fashion illustration advertisement from 1947 . This is one of a few illustrations for Lilli Ann that was launched after World War II. It was short term, apparently the brand favored fashion photos. Don't you just love the sophistication? Were women really this romantic and men that dashing? This season's "Mad Men" episodes should continue moving forward into the later half of the 1960's. We can expect to see a more diverse styles in that era. Probably the most consistent looks will be prints and color. It's hard to imagine this era without bold pattern or color. The first dress shown here has "the look": a Mod style "A" line shift in classic houndstooth pattern, it has a bow accent with low peter pan collar that would have seemed very British is style to an American customer. This look would appeal to a junior shopper who was looking for a bold fashion statement. This dress is a more sophisticated silk chiffon style. It would have been custom ordered from I.Magnin's on the west coast. The sleeves are sheer with jeweled cuffs and collar (which were so popular then). The shifts below follow the trend with abstract prints on a smooth shift silhouette. Worn by all age groups, the shift would be the most common look during that era. The changing scene would create a rising look in hemlines, moving up to finger tip length by 1969. Pucci-style bold patterns dominated both junior and women's apparel. Here copies of the iconic look are seen in bright, dramatic color designs. Both dresses have engineered prints which were custom made to be cut and sewn into dresses with balanced patterns and borders. Both are also jersey knits, which were becoming wildly popular. This type of long dress would be increasingly popular for casual wear. Worn at parties, picnics and proms, the longer length was brought on to the scene by the hippie styles seen in San Francisco and elsewhere worn by the youth movement. For the more mature or conservative woman who still wanted to emphasize her waistline, there were still styles with fitted bodices. Although this silhouette might seem dated, the fabric design would be strictly late 60's with bold pattern and bright florals. The longer dress in chiffon might have been worn during an afternoon party, barbeque or wedding. It has a trailing scarf that floats from the left shoulder. The short blue floral print dress was custom ordered from I.Magnin's which catered to a wealthy customer who wanted top quality textiles but often with a more conservative look. At a career and professional level, the shirt dress assumed the required shift silhouette, but it might be belted by the woman who wore it. A younger customer would have worn it without a belt, but snug around the hipline. The three shirt dresses here all have bold patterned fabric, in keeping with the era. The top dress is a mock plaid with floral overlay. These 'happy flowers' would be a dominate pattern, seen all over the fashion scene. The middle dress by Lanvin, uses that logo on the textile in an engineered print to create the contrast hem detail. The final dress is clearly influenced by abstract art. 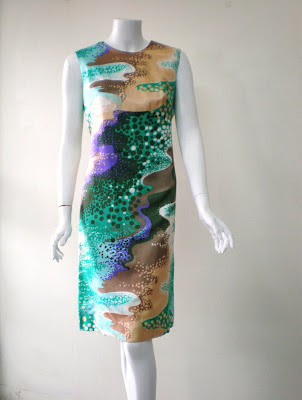 All dresses are synthetic fiber. Many are polyester. This 'miracle' textile would be 'wash and wear', releasing women from ironing chores that could have taken one day each week to perform. Now it's time to decide who will wear what. Will aging characters like Joan and Betty opt out for the latter fashions here, or go forward with current trends? At that time, married women were expected to assume a certain level of decorum, especially if they were over 21. And what about Peggy? Her fashion sense has never been spot-on, so she can probably be expected to keep her career wear conservative and slightly outdated. But in her free time she might swing over into the more ethnic and experimental looks of the youth movement. Will she choose batik Indian print wrap skirts with peasant tops? Megan was last seen in current mod silhouettes, so being one of the younger women she should continue to be fashion current. Will her marriage affect that youthful look? Will she try to assume a more mature style, or stay on trend? As for Trudie, she has leaned toward a feminine junior silhouette. Her ongoing style has been to wear quality textiles with very modern silhouettes in girly prints and colors. Will that keep up as she stays at home? What's your take in predicting what we'll be seeing? These illustrations are from a women's magazine dated July, 1879 called "Peterson's Ladies National Magazine". Within the pages are everything a home maker could want. This includes a clear illustration showing the mechanics of the then current bustle drapery. That month the magazine featured a bustle with a two panel draped front, and a bustle train in the back. All of this would be fastened at the waistline, and covered with the longer basque bodice 'jacket'. The bustle draft shown here takes alot of the mystery out of bustle arranging, showing how it is really just a puffy apron worn over the underskirt. It's kind of amazing to think that this might be all a woman might have had as reference in making her own fashionable costume. Ideally she got some help, and was able to copy an existing bustle that her cousin had tailor made in Boston, rather than reinventing the wheel on her own! What you aren't seeing here is that most successful bustles where draped on the bias, so that those front corner 'points' are probably right angles where the selvage and cross grain meet. The bustle pleating was similar to bunting, ruching up the fabric to create the necessary drapery. With a growing popularity in outdoor living, California designers during the 1940's and 1950's developed a fashion niche to meet the needs of that lifestyle. Easy to wear separates were very popular with innovative shorts and skirts as part of these looks. Designer De De Johnson created outfits perfectly suited to the outdoors life style of California women. This fresh yellow outfit has a whimsical patio print for visual interest, making it perfect for entertaining and resort. The shirt and shorts set shown below is by Joseph Zukin of California. This set is a rayon blend from 1945. The print shows an ariel view of New York city with a balloon motif that is accented by little red ball buttons that repeat the balloon shapes in a novel way. This set shows the popular look of matching both top and bottom to create a 'romper' or one-piece shorts look with an easier fit. Both outfits were on display at California Design: 1930-1965 in June 2012 at the Los Angeles County Museum of Art.